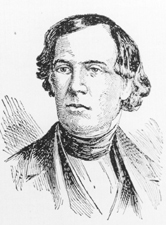 WHITCOMB, James, a Senator from Indiana; born in Windsor County, Vt., December 1, 1795; attended Transylvania University, Lexington, Ky.; studied law; admitted to the bar and commenced practice in Bloomington, Ind., in 1824; prosecuting attorney for Monroe County 1826-1829; member, State senate 1830-1831, 1832-1836; appointed by President Andrew Jackson as Commissioner of the General Land Office 1836-1841; resumed the practice of law in Terre Haute, Ind. ; Governor of Indiana 1843-1849; elected as a Democrat to the United States Senate and served from March 4, 1849, until his death in New York City, October 4, 1852; chairman, Committee on Claims (Thirty-first and Thirty-second Congresses), Committee on Public Buildings (Thirty-second Congress); interment in Crown Hill Cemetery, Indianapolis, Ind. American National Biography; Dictionary of American Biography; Whitcomb, James. Facts for the People in Relation to a Protective Tariff. Indianapolis: G.A. & J.P Chapman, 1843.